Foodies are at the right place, here at CaseCompany! We created a whole bunch of smartphone cases with food prints, allowing you to enjoy your passion at any time, even while on the phone! Whether you’re young or old, or whether you prefer vegetables or candy, we’ve got something for everyone. Just take a look at our extremely culinary collection of smartphone cases with food prints. Pick out your favourite dish and have us print it onto your brand new case! Both our in-house designers and several guest designers let their imagination run wild in order to provide you with ample options. There are plenty of different styles to choose from as well, so you’re sure to find something to your liking. Go on a healthy diet with coconuts, strawberries, pineapples, bananas and other fruits and vegetables! You can even turn your smartphone into a slice of watermelon, or perhaps make it look like a fried egg! 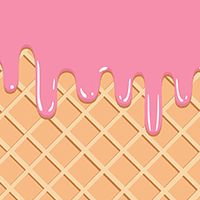 The sweet tooths among us may enjoy our ice cream patterns. And those who prefer a quick bite to eat can just check out our fast food menu! Pizzas, hot dogs, hamburgers, french fries,… even a chicken sandwich! And remember: “Fries before Guys”!